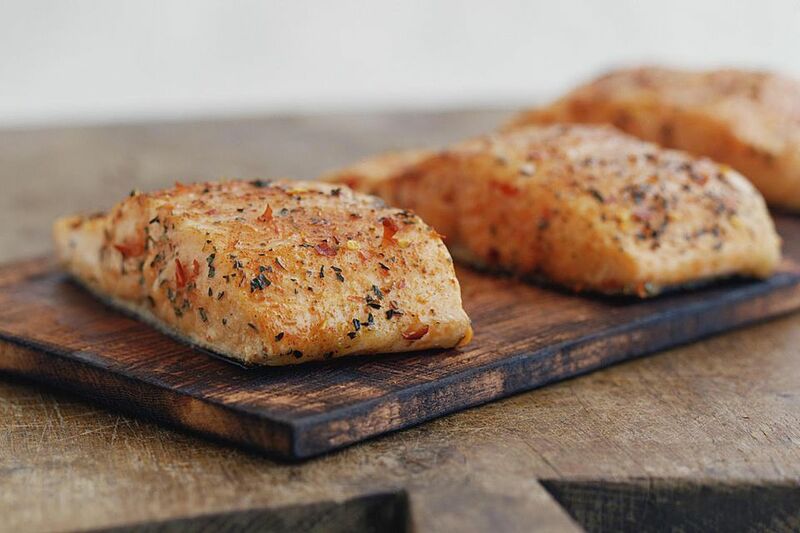 A classic grilling recipe, cedar plank salmon results in smoky, moist, aromatic fish. You can take the flavor in any direction you like with a dry rub or marinade, or you can keep it simple and really highlight the taste of the fish. For an especially impressive presentation, bring the salmon to the table on the plank, and cut individual portions from it. Be sure to purchase food-grade cedar planks, which you can find at some grocery stores, most kitchen stores, and home improvement stores that sell grilling supplies. You can also order them online. Avoid any wood treated with chemicals or additives, which can affect the flavor of your food and add an unhealthy element to your meal. Soak the cedar plank in water for at least 30 minutes and up to four hours before you start the grill. Preheat the grill ​for medium-high heat. Remove the cedar plank from the water and place the salmon fillet in the middle of it, skin-side down. Brush the top of the salmon fillet with olive oil; squeeze the lemon juice over the salmon. Scatter the lemon zest and the dill on top, then season the fillet to taste with the salt and pepper. Place the plank on the grill in the center. Cover the grill and allow the salmon to cook, undisturbed, for about 20 minutes. Test the internal temperature at the thickest part of the fillet with an instant-read or meat thermometer. Pull it off to rest at about 138 to 140 F; the USDA recommends cooking salmon to an internal temperature of 145 F, but the temperature will continue to rise another 5 to 10 degrees after you pull it off the grill. Let it rest for 5 to 10 minutes before you serve it. Add wine, spirits, vinegar, salt, or aromatics such as a bouquet garni to the soaking water before you add the plank, which can transfer subtle flavor to the fish as it smokes. You can often clean a plank and reuse it. Just scrub it down with water and a scouring pad (never use soap, which can affect the flavor). But be wary of ingredients that burn easily, such as barbecue sauce, teriyaki, and fruit-juice infused marinades. They can impart an acrid flavor to the smoke. If you see some stuck on, it's best to discard of the plank. Keep the grill covered as you cook so the smoke circulates around the fish. Experiment with other species of hardwoods for different flavors, such as alder, the traditional wood for smoking salmon; or cherry, maple, and pecan.